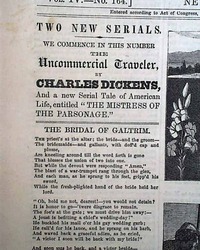 The Charles Dickens Collection - This three issue set features one issue edited by Charles Dickens (either Household Words or All The Year Round from the 1860's), one issue of The ILLUSTRATED LONDON NEWS from the Dickens Era (1850's), and one issue of The Times (London) from the Dickens Era (1840's), providing a contextual background for the work of this literary giant! Inventors & Inventions Collection II The Early 1900s Set - Each set contains 5 issues of The Scientific American Magazine, one each from 1900s, 1910s, 1920s, 1930s and 1940s. With the industrial period as a foundation, follow the inventors and inventions of the first half of the 20th century. An interesting technological look at this rapidly changing period in history. Literary Collection II Harpers Monthly Magazine - Follow one title for half a century to capture the progression of literary history and technique spanning 5 decades. Five issues from the 1850s, 1860s, 1870s, 1880s, and 1890s. War of 1812 in Context Collection - five issues, one each from 1806-1811, 1812, 1813, 1814, and 1815-1820. Issues from just before, during, & just after the war place the war in context. 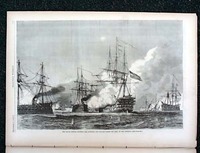 War of 1812 in focus collection A group of three issues, one each from 1812, 1813, and 1814, providing a perspective of the entire war. All issues have war-related reports. 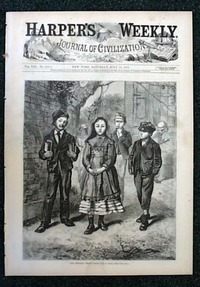 Civil War Survey V The War Perspective Collection - 5 issues, one each from Harpers Weekly Illustrated, The Oneida Circular (religious), a foreign publication, a New York newspaper, and a newspaper featuring a front page map. Gain an enhanced perspective of the war era through the pages of these varied titles. A very unique collection. Civil War Survey III The Illustrated War Collection - 5 issues of Harpers Weekly Illustrated, one each from 1861, 1862, 1863, 1864, and 1865. With one issue from each year of the war, this is a great set to obtain a concentrated and visual view of the war. All issues have several wood engraved prints and related news reports. Civil War Survey II The War in Context Collection - 5 issues, one each from 1856-1860, 1861-1862, 1863, 1864-1865, and 1866-1869. With one issue each from both before and after the war, and three issues from during the war, this is a great set to help place the Civil War in context. Civil War Survey I The War in Focus Collection - 5 issues, all from New York titles, one each from 1861, 1862, 1863, 1864, and 1865. With one issue from each year of the war, this is a great set to obtain a concentrated view of the war. All issues have Civil War related reports. Moments in American History IV - 1940s (war), 1940s (post war), 1950s, and 1960s Each set contains 4 issues, one from each decade shown, providing news of the day, advertisements, etc., revealing a great snapshot of life as it was actually occurring. All issues are from major American cities, providing national news coverage. This is set 4 of a five part collection. A 7 issue set containing one issue each from the administrations of Benjamin Harrison, Grover Cleveland (2nd), William McKinley, Theodore Roosevelt, William H. Taft, Woodrow Wilson, and Warren Harding. This is set 4 in a five part collection. A 7 issue set containing one issue each from the administrations of Abraham Lincoln, Andrew Johnson, Ulysses S. Grant, Rutherford B. Hayes, James Garfield, Chester Arthur, and Grover Cleveland (1st). This is set 3 in a five part collection. An 8 issue set containing one newspaper each from the administrations of Martin Van Buren, John Tyler, James Polk, Zachary Taylor, Millard Fillmore, Franklin Pierce, and James Buchanan. Note: William Henry Harrison's 1 month administration is now included! This is set 2 of a five part collection. A 7 issue set containing one issue each from the administrations of Calvin Coolidge, Herbert Hoover, Franklin D. Roosevelt, Harry Truman, Dwight Eisenhower, John F. Kennedy, and Lyndon Johnson. This is the 5th and final set of a five part collection. Moments in American History I - 1800s, 1810s, 1820s, 1830s, and 1840s Each set contains 5 issues, one from each decade shown, providing news of the day, advertisements, etc., revealing a great snapshot of life as it was actually occurring. All issues are from major American cities, providing national news coverage. This is set 1 of a 5 part collection. 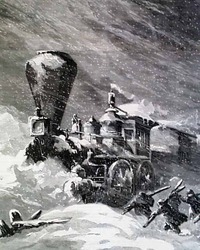 Moments in American History II - 1850s, 1860s, 1870s, 1880s, and 1890s Each set contains 5 issues, one from each decade shown, providing news of the day, advertisements, etc., revealing a great snapshot of life as it was actually occurring. All issues are from major American cities, providing national news coverage. This is set 2 of a 5 part collection. Moments in British History & Literature III 1830s, 1840s, 1850s, and 1860s. Each set contains 4 issues, one from each decade shown, providing news of the day, advertisements, etc., revealing a great snapshot of life as it was actually occurring. 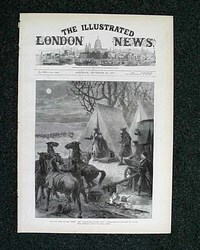 All issues are London Gazettes, London Times, and Gentleman's Magazine. This is the 3rd and final set of a three part collection. Wild West Collection I - A California View - Each 7 issue set containing 7 different titles from California, all dated from the heart of this formative period in American history - 1870 to 1899. The set will include at least 2 issues from each decade.